Personal is an emotional component that denotes interactions that are based on firm employees or proxies listening, observing, caring for and interacting with users who have unique combinations of characteristics, situations and desired outcomes that distinguish them from everyone else. This is the core human element of PIE, which leverages digital social technologies. Individualized means offering to users a granular mix of digital services, content and other assets as a function of the firm’s knowledge of individuals, with the aim of serving them. This the technology and process part of PIE, which employs big data to automate and deliver the firm’s knowledge of user outcomes. Experience refers to providing robust, consistent functionality, connection and community, seamlessly, across a variety of device and communication types. This is the infrastructure part of PIE, which uses ecommerce, mobile, kiosk and other technologies. PIE is the goal of digital transformations led by Chief Digital Officers. It is the new bar that organizations must meet to increase or maintain their relevance to users, and social business, mobile, big data and ecommerce are the means to deliver PIE to users. Firms can develop the capability to offer PIE by focusing on its components in any combination. PIE proactively addresses a deep rift between firms and users, who often see firms as uncaring organizations that are focused on maximizing profit at any cost. Although most firms have yet to fully understand it, digital social technologies have profoundly changed the relationship among firms, their products/services and users. The root of the rift is that users care about outcomes, and firms care about products. Understanding user outcomes is the key to developing authentic and profitable relationships with users. Users rarely buy products or services because they want them; they buy the effect of using products and services to attain personally meaningful outcomes. In other words, products and services are the means to the end. Also, outcomes are emotional even though people usually employ intellectual rationalizations. In their interactions, firms have become quite disconnected from users, who are quickly changing each others’ expectations about what interacting should be like. When users interact with each other online, they interact as individuals, so firms look hollow in comparison because their communications are focused on promoting their products and services in the effort to “sell” them to users, who rarely care. Digital social technologies have given firms a practical way for firms to understand outcomes of individual and niche users. 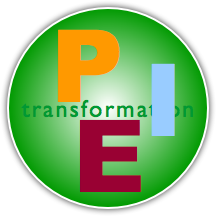 PIE is how firms will realign with users and consequently increase their influence and profits. The first step for firms is to shift their focus away from their products/services to helping users who are relevant to the firm’s competencies to attain their desired outcomes. The second step is realizing that creating, delivering to market and servicing their products/services has given them a unique combination of knowledge and competencies that are relevant to users in specific situations. This knowledge is valuable to users—independently of products/services. People buy holes, not drills, and firms can realign with users by participating in interactions about holes. They will sell more drills when they are aligned with users. The relationship between firms and users is shifting from “utilitarian” to “personal.” When firms make themselves more personal, they will sell more, and at higher margins. This piece refers to the human social part of the firm’s relationships with individual users. Digital social technologies, whether used through computers or mobile devices, enable the firm’s people listen and respond to users, usually in public. Most executives don’t take seriously the concept of relating to individual users at scale because they falsely assume that they will be interacting with all their users. “We could never afford that.” However, most users don’t want individual interactions with the firm, even though they want to have the option. This assumption is very understandable; in the 20th century Industrial Economy, firms communicated with customers in a one-to-many model (mass communications). Social technologies have disrupted and weakened the influence of mass communications. See Networks vs Mass Communications for more detail. The network effect transforms communications because it adds tremendous leverage to online interactions, which are often broadcast to participants’ networks. Firms that understand this proactively seek to interact with niches of high-priority users. When they have such interactions in public, they demonstrate their care and consideration of users and model caring behavior. Naturally, they also respond to users who initiate interactions. By consistently going beyond expectations in these interactions, they inspire users who are motivated to interact, thereby sharing the interactions with their networks. This increases the audience of the interactions ten-fold on average. In addition, online digital “conversations” function like annuities; users can find them and reuse them at any time in the present or future, so firms’ assistance to users is immortalized. Networked communications represent a completely new model: firms interact with the few to reach the many. This only happens when their interactions are above expectation, which is achievable when they focus on empowering users to attain their valued outcomes. In addition, research has consistently shown that only about ten percent of users ever interacts; fully 90 percent of a crowd observes others’ interactions. However, all people are affected and influenced by the behavior they see. When they observe firms consistently supporting other users, who often have similar interests and outcomes to theirs, their trust levels increase significantly. In effect, firms directly serve the few and indirectly serve the many. Social technologies are the most analog of the digital because people are relating using digital technologies. Big data and mechanical computerized functionality and apps add serious value, but they aren’t human. PIE results from an optimal mix of the two. The Individualized piece maps most closely to big data and analytics. Firms have a tremendous amount of information about individual users, but few have transformed the information to make it useful to users such as customers and prospects. Firms start by using big data to develop a rich view of users based on data from purchases, mobile and web interactions and smart devices. This enables the firm’s back house to support users by offering information and products relevant to user outcomes. Well designed analytics infer users’ interests based on transaction, social and other data. A simple example is a hardware store that uses purchase, online and customer service behavior, analyzed by geography, age and other factors, to form hypotheses about high-impact users. Then it tests the hypotheses in social venues and creates initiatives that support outcomes such as building a pool in the backyard. Social venues enable the firm to understand and test emotional outcomes that underlie the pool decision. On another business front, many firms sell commodity products and services, and they struggle with “churn,” when customers that leave to take advantage of another offer at a competitor or substitute. Firms that assemble, integrate and deliver the information they have about individual and niche users to help them achieve outcomes will dramatically reduce this problem when they organize it to serve user outcomes. Firms and their marketers like to believe that “content sells” because “content” encapsulates one-to-many mass communications, it is fantastically scalable and it was effective. I write this having been at the marketing helm several times in my career. Content that “sells” has steadily lost its effectiveness, so much of it now seeks to entertain or add value in other ways. That said, the new golden age of content is coming to firms that shift their emphasis away from selling to serving. In so doing, they will sell more. Firms’ mass marketing has promised anything and everything to get attention via advertising, promotions, packaging, loyalty programs and direct communications, but users believe firms and brands less and less. In general, as users have lost trust in firms, and responses to marketing tactics have fallen, marketing has made ever more fantastic claims to vie for attention. Overall, the credibility of their communications is at an all-time low. Talk is cheap. In 2013, marketing and advertising agencies are responding by pitching firms on the idea of “telling a story” when designing and delivering marketing content. They dream of engaging users in serial ads. This will prove to be a short-lived incremental improvement at best because it doesn’t address the core issue; it is seeking to engage a jaded audience that gives these communications little credence. Entertainment is cheap. What agencies and firms overlook is that firms now co-create their own stories by serving high-priority users online. Interacting online is real; ads are fake. In digital social venues, firms have lost control, and hundreds or thousands of users are interacting for many reasons, but virtually none are motivated by selling product. They are more interested in helping people, building their reputations, learning about situations and having fun. Firm images on websites, brochures, mailers and TV ads say how much they “value relationship,” but it doesn’t ring true. However, when they consistently help people in public to attain outcomes, they show that they care and regain credibility. Conversations in which users and firms together are talking about user outcomes are the new “content.” Users love these conversations because they tend to be outcomes-focused, and they have high credibility. Smart firms love these conversations because they are public, so firms can reshare them widely. Here the firm uses all practical touchpoints to create a seamless experience that’s available to users under a wide range of conditions. Experience anticipates ubiquitous computing’s smart devices and capabilities. Experience encompasses mobile and ecommerce as well as in-store, in-device and other digital and analog spaces. The firm’s interactions are built on its beliefs and competencies, which it focuses on the outcomes of its highest priority users. In Experience, the firm uses ecommerce and mobile to support users with connectivity and functionality. Experience refers to the firm’s “properties” such as websites, mobile apps and physical stores as well as its presences in the ecosystem at large. For example, a firm will have teams interacting in non-firm digital social venues in which an optimal mix of users consistently talk about outcomes relevant to the firm’s knowledge and business. Community refers to a group of people with shared mission, values and interests, and it can emerge wherever users gather, communicate and collaborate. Based on their businesses and highest priority users, firms will invest in building and strengthening communities, and they refer other users to those communities and encourage their interactions there. PIE enables another level of community. Firms traditionally “invest” in communities in which they have physical presences by supporting the arts, policies, schools, etc. These are efforts to show people that they “care.” Digital social venues enable a much more active approach that addresses individual user challenges and opportunities that firms support in (mostly) online communities. The network effect amplifies the impact of interactions in digital communities. “Community” can refer to blogs, forums, social network pages or any other space that supports many-to-many communication and collaboration. In addition, firms care as much or more about communities they don’t control when users show that they feel most comfortable there. PIE is grounded in understanding and serving individual users in public social venues, but it cannot really start until firms develop a new level of knowledge of who their highest priority users are, what their critical outcomes are and how they are trying to attain those outcomes (user “workstreams”). Social business interactions are the fastest way to develop in-depth understanding of user outcomes, so it’s the filling of PIE. Individualized experiences are incrementally better than what firms provide now. Personal individualized experience comes from fusing the firm’s social insight with its data and interactive capabilities. Social accelerates understanding in two ways: first, users interact with each other in digital social venues, and extensive tacit knowledge about outcomes emerges. Conversely, when firms have controlled interactions with users, as in marketing research, they set the context for the conversation. Since firms have a secondary interest in user concerns, minimal outcomes information emerges, and what does come out is usually oriented to products. On the other hand, user-to-user interactions are all about outcomes, with products playing second fiddle, and users mirror and challenge each other quickly and efficiently. The second part of the social business accelerator is that firms can ask questions to correct or validate their understanding of outcomes very quickly. Millions of potential online users self-select by finding, observing and participating in conversations about outcomes. Users are far more likely to understand each other than firms, which have a totally different orientation to the situation; they usually only reference outcomes in order to sell product. Social is critical in another way because personal interactions are often the fastest way to develop trust with users. When firms show their consideration and care by proactively supporting users’ outcomes as their primary objective (instead of selling their products/services), they win trust. By showing that they care more (or at least as much) about user outcomes than product sales, firms will increase sales and profits, almost like a commercial knock-on effect. Trust is also required in order for users to permit firms to use their data to add the most value. Users will object to firms they don’t trust using individual data about them. PIE is the ultimate rationale for digital transformation. Social, mobile, big data and ecommerce are just technologies that will have a minimal effect on firm influence and profit unless digital executives ground them in creating human impact, which is grounded in user outcomes. Most firms and teams are built on assumptions that are less true every day. For example, executives seek to leverage industrial scale, from manufacturing through communications.” Scale that is not personalized will see diminishing returns and trap unwary CDOs. PIE is the main ingredient of the Chief Digital Office.